My mom sent me some more pictures of the boys. Since I can't seem to take any, or upload them, I'm grateful. She and my dad took the older two to the big city the weekend before Christmas to do some shopping. 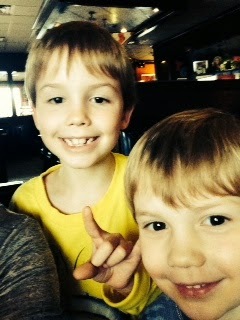 They boys took a selfie at a restaurant. They like eating out. 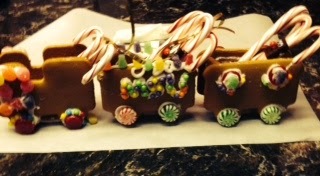 After Christmas, she bought a gingerbread train kit. They made it Friday night. Much cuter with the artists holding their creations. 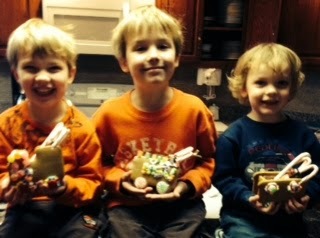 Little Elvis' was the most decorated. He definitely believes that more is more, and takes any chance he can to put MSU into whatever he's doing. He made several ornaments at school before Christmas. All had some sort of MSU tie-in. My favorite was the gingerbread man football player. He drew a helmet on it and everything. I'm sure Baby Plum just wanted to eat his. That child is a big fan of sweets. His favorite is chocolate, but he loves all things sweet. Except for the Cinnamon disks he used as wheels. That popped right back out of his mouth after he popped it in. Cheese Puff has been fighting us on eating regular things, and we've pretty much given in since Wednesday. This morning, he ate apple slices and cut his eyes at me the whole time. I let him. It's not quite two weeks since the surgery, but he seemed to be handling it fine. We're keeping him away from pretzels and popcorn, but letting him eat just about everything else. Gram took pictures of the play! I didn't take pictures at the play that both boys were in, but Gram did! 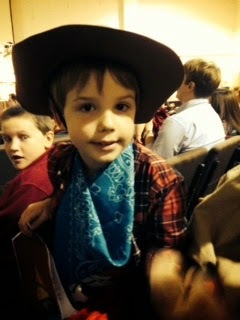 Little Elvis as Leroy the Cowboy. Leroy with his trusty steed Baby Plum. Close up of Baby Plum as a horse. She also threw in another shot of Little Elvis with Bully. I believe his brothers were doing the Ole Miss "landshark" and he was mad at them. I've neglected our two other boys on the blog this week. They've been busy. Little Elvis wanted a stuffed bulldog for Christmas. He made this request late. Santa had already bought him too much. So, when I found one of these bulldogs at a local thrift place, I let him buy one with his own money. Wow, he loves this thing. He made it a welcome sign the second he got it home. Yay Bully! In other news, Little Elvis was in two plays this week, and Baby Plum was in one of them and had a class performance. Did I take pictures of the one they were both in? No. Why? Because I forget things. Little Elvis was a cowboy, and Baby Plum was a horse. They did well. 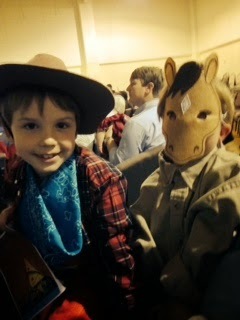 The second play was Little Elvis' school play. He got to "introduce" the play, and then had two lines. Here he is staring out of the curtains while waiting to introduce the play. Baby Plum enjoyed sitting by his Daddy. This picture kind of shocked me. He looks so much like his Daddy in this shot. I've got a picture of Bob doing a similar pose somewhere.... It will never be found. This play was cute, and he did a good job. We couldn't go to Baby Plum's program, because it was the morning of Cheese Puff's surgery. My dad and grandmother went. My dad shot video on his phone. Baby Plum completely ignored them, just like he ignores me when I visit! But he sang and did the dance steps very well. He even ignored Bob this morning. Bob played Christmas songs for Baby Plum's and Little Elvis' classes. Baby Plum wouldn't look at his daddy! Bob says he's just so shy that he doesn't want any extra attention. Who knows? They are all out of school now. Bob's just about finished with the crown molding in the sunroom. I hope the boys will let us complete more projects, or maybe even help us do them! Cheese Puff has found my straw hats and vintage purses. He likes for us to don hats, grab our bags and go traveling. We attempted a selfie. I'm not fond of them, but wanted to show off how he styled me with a vintage straw hat. This sweet baby seems to like the cats. His older brothers don't. Slappy is not too fond of him. At least not yet. I was taking pictures of items to put up on ebay, and he helped me by asking that his picture be taken as well. Bob performed at his school on Monday. We didn't tell him. He was so excited when he saw us in his room. I wish I had the camera ready. His little mouth was a perfect "o." It was someone's birthday, so he was happy to stuff his little o mouth with a cupcake. Bob sang Christmas songs while the kids ate their cupcakes, and then Cheese Puff got up to do the Weather Wiggle. He's pretending to be just like mommy, and has curled up under three blankets. He's also doing the "land shark." I think it's something the Ole Miss defense does. Thankfully, Little Elvis wasn't home. He missed his class party due to his surgery. But there are two sets of 2-year-old classes at his school. He goes on Monday and Wednesday. The other class meets on Tuesday and Thursday. They invited him to the Tuesday party, which was so kind. He didn't really know what to do with himself amidst all the new kids, but he ate some chips and waited patiently for his turn during the book exchange. He was very sweet. The assistant teacher talked about how laid back and sweet he was. Sweet baby Cheese Puff had his tonsils and adenoids removed this morning. He didn't really know what was going on, but was game for it. My parents bought him special pjs for his big day, but we had to put him in a gown for the actual procedure. Thankfully, they didn't make him wear the hat. He was so good. He was hungry this morning, but didn't fuss too much when we didn't give him anything. His surgery was early, and we were happy about that. We didn't wait too long, and he got to watch some Mickey Mouse while waiting. We don't have that cable package anymore, so that was a big treat. The doctor said he did a great job, and told us that while we knew his tonsils were huge, his adenoids were causing 70% blockage. This explains more of his breathing problems at night. He would go all day without a sniffle, and sound so stuffed every night. He spent about an hour in recovery, and when the nurse wheeled him back, she told us that she thought about just keeping him with her because he was so cute and sweet. She may say that to everyone, but he is cute and sweet. He just wanted to snuggle when they brought him back, so I laid on his little bed and held him. He slept and snored. They said his snoring would be bad for a couple of days. Cheese Puff's been pretty calm today. He pitched a big crying fit when we wouldn't let him eat dry cereal. We offered him lots of other options, and he finally settled on Gogurt and yogurt. When I was in junior high, I had to have surgery to put a button on one of my teeth. I remember crying because I wanted a fried chicken sandwich from Wendy's. I had a brand new hole in the roof of my mouth, and wanted to stuff it with crunchy bits of fried chicken. So, he came by that very naturally. He wanted to play a sports game once Baby Plum got home from school, but we weren't supposed to let him. The doctor was adamant about not letting him rough house with his brothers. He wanted to pick up 17 pound Wally. He's not liking not being able to do what he wants. He can't even run. Poor little active baby. I know that we're in the easy part right now. From what I understand, tomorrow and Friday will be very rough. But he's been such a sweet, little trouper. We're so proud of him. When we try to get three children (dressed fairly nicely) to look at the camera and smile at the same time. This is our first attempt. It pretty much sums up the boys, and I'm tempted to go with it. Little Elvis is mad, because we don't have three Christmas headgear thingies, just two. He's making his patented squinchy face that he makes whenever I say something he doesn't like. So, all the time. Baby Plum's trying to keep the peace -- a talent he's quickly losing as Cheese Puff gets older. And Cheese Puff looks like he's singing. Notice the orange sneakers? I told him to wear his other ones, but got the squinchy face. Little Elvis has the hat, but Baby Plum is ok with it. Cheese Puff's gazing at something beautiful in the distance. Little Elvis is no longer making a mean face, but he's not smiling yet. Best of the bunch, and it's fuzzy. Baby Plum looks like he's posing for an ad for a musical. Little Elvis choking Baby Plum with love. We tried to get one during breakfast with Santa, but it doesn't really look good either. Gah. No one is getting what they asked for. Not exactly. Little Elvis asked for Lego Movie legos. He's getting regular legos. Baby Plum wants a Ninja Turtle costume. He doesn't watch the Ninja Turtles, and doesn't wear costumes. He's getting lots of random things I think he'll love. Cheese Puff, in a show of solidarity with his older brother, also wants a Ninja Turtle. He also doesn't watch Ninja Turtles. This one is also getting things I think he'll love. I farmed out the Ninja Turtle toy for Cheese Puff to one of my aunts. And to make amends to Baby Plum, I'm going to attempt to make Ninja Turtle masks out of felt. That way they kind of get what they asked for. My mom sent me this picture of Cheese Puff last night. 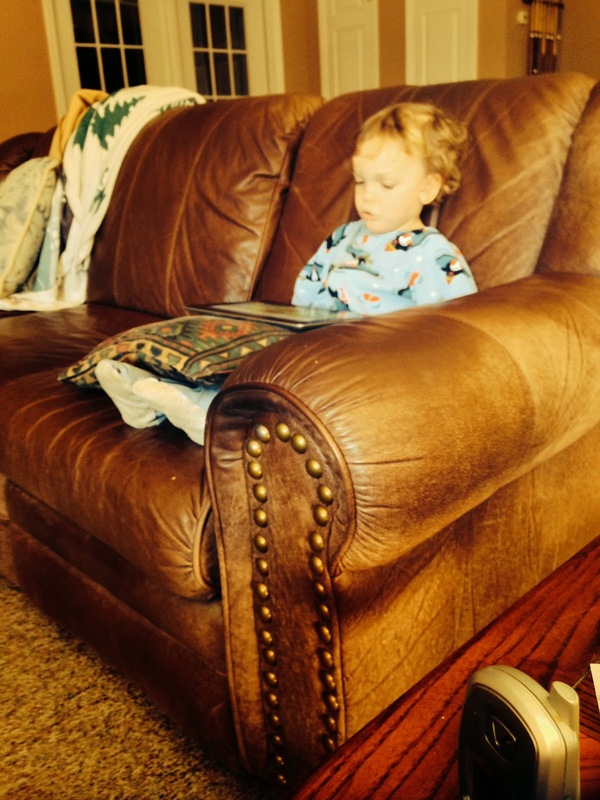 He looks like such a big boy, despite the footie pajamas. 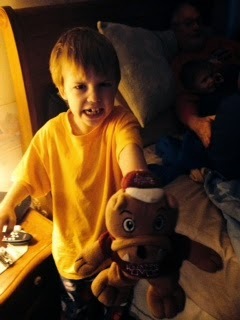 He is going to have to have surgery on his tonsils. The whole breathing at night issue had the doctor worried, and then he looked at them. They're huge. His surgery's next week. He doesn't really know. I also haven't told his brothers. I'm never quite sure how Little Elvis will react to anything. I'm worried. That's my nature. Bob will be with us. He's not the worrier that I am. I've talked to another mother who had her baby get his tonsils removed. She said it was hard on both of them, but definitely worth it. Bob talked to a student who had the surgery when she was older. She said it made such a difference in her life. And then we hear his breathing at night. Some mornings he wakes up after what should be a good night's sleep with little dark circles. Poor sweet baby. He is the sweetest little thing. He really is. His teachers love him, as do his Sunday school teachers. He is loving and silly. His new favorite thing to do is "smooch." He'll kiss my cheeks, three times, saying "smooch" with each kiss. He still sings all of the time. We downloaded "Turn Down for What" for Little Elvis this weekend, and Cheese Puff started singing along with it immediately. (It's an easy song to figure out.) He sings "All About that Bass" and "Jingle Bells" all the time. He doesn't need the radio for prompting. The doctor said he may have to relearn how to talk some, just because he'll be going from no room in the back of his throat, to room. I hope he's still able to sing. We've been stocking up on liquids for him. You have to work really hard to wear a mask that covers your entire face, but still get across that you are very sad. Baby Plum does that, though. Why is he sad? Not really sure. This child loves music, we got him into the choir a few months early, because he loves music so much. But here lately, he's refused to go to practices, or as this picture shows, pouted. Once we left, he was fine. 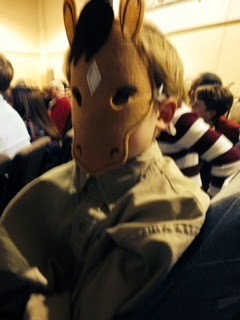 And he's now excited about being a horse in the Christmas musical. But Baby Plum's been a tough nut here recently. He cries at the drop of a hat, pouts over everything, and doesn't obey at all. It's very frustrating. I'm not sure if Baby Plum is just deciding to try out the terrible twos now, or what. Maybe he's been patiently waiting all of this time for his older brother to stop experiencing the terrible twos, thunderous threes, etc.? Maybe he knows Cheese Puff's time is coming, and he needs to sneak his in before that door fully closes? These pictures are about two weeks old. They really aren't accurate anymore. But, this is the music corner of our new sunroom. Bob has since built a guitar rack that looks really nice. We also modified our old changing table to hold the keyboard. Notice something on Baby Plum's head? The green something? Bob special ordered these lights. They change colors. You can set them with a remote, or just let them cycle through. The boys love it. Well, Baby Plum does. Little Elvis seemed to on the first day, but has since forgotten. Cheese Puff doesn't really care. But I know Bob loves them.